How could so many of us get it so wrong for so many years? I’m talking about how to pronounce the name Charatan. We all turn the "ch" into "sh" so it sounds like Sheraton Pipes, just like the hotel chain. But that is not correct. It is Charatan with the "ch" pronounced like Churchill. 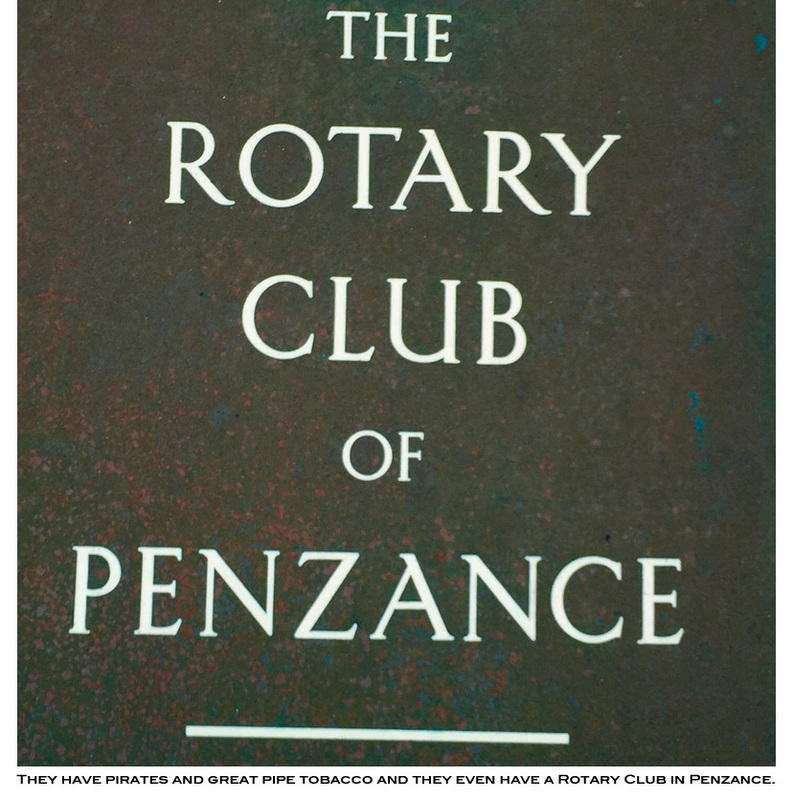 I learned this on a recent visit to England — not just England but a town named Penzance. Yes — the same town whose name has become one of the most popular of the Esoterica tobaccos blended by J.F. Germain and Son. It is also the town that had pirates and inspired Gilbert and Sullivan’s comic opera, "Pirates of Penzance." My meeting was with Ken Barnes, who is something of a legend in the pipe world to old-time collectors because of his extraordinary success in helping build the James Upshall pipe company into one of the most respected of all time, yet a man who completely dropped out of the world of pipes more than two decades ago. I always wondered what happened to him. Brian Levine interviewed Ken on his radio program (Show #178), and I was thrilled to make contact. 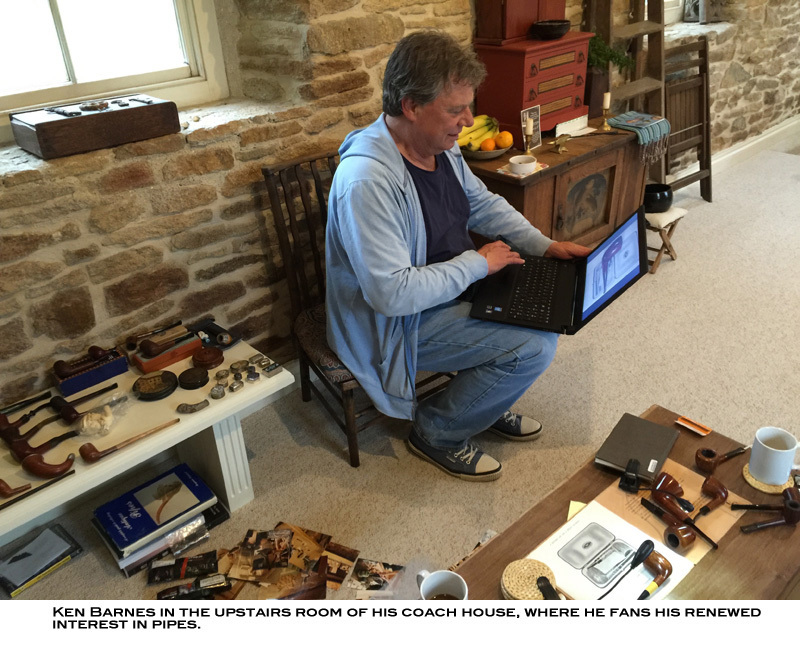 I told him that my wife Carole and I were planning to visit the English countryside, and a few months later we wound up spending a day talking pipes at his beautiful house in Cornwall. 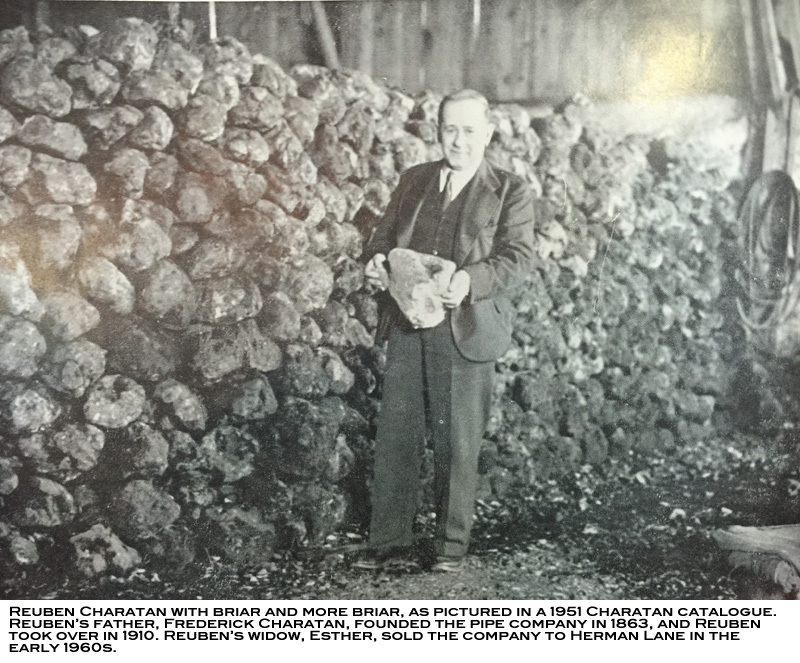 Frederick Charatan was born in circa 1849 in Austria and died in 1918 and had lots of children … Reuben, his successor at Charatan pipes, was born in 1887 in Mile End (300 yards from the Charatan factory in Mansell Street) and died in 1962. I think that after Reuben’s death, his wife Esther did allow the company to continue under her supervision for a while and eventually sold it to Herman Lane - possibly in 1963-1964 … My father joined the company in 1967 and did meet Esther Charatan (I seem to remember). 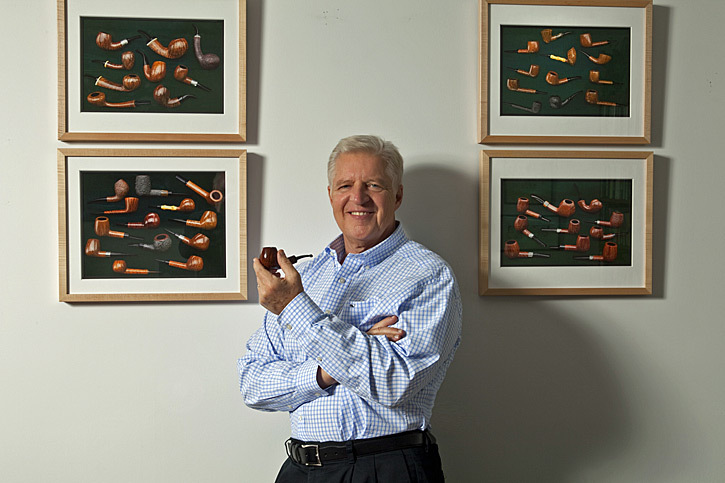 Herman Lane started distributing Charatan pipes in the U.S. in 1955. Herman Lane talks about it in his book ‘The Tobaccoman’s Log’. Everyone who worked for the company called it CHaratan and it is only in the U.S. that people call it ‘Sharatan’ and it was mimicked as a joke from time to time. I remember years ago when Jim Benjamin pronounced Charatan pipes like Churchill pipes, and I asked him why he didn’t say Sheraton pipes. He said someone told him a long time ago that it was pronounced Charatan with a hard "ch" and not an "sh". I should have listened, especially before recording my audiobooks! I find myself saying Sheraton most of the time but occasionally, with Jim Benjamin’s advice ringing in my ear, saying Charatan. For many years I have collected James Upshall pipes and believe them to be a fantastic value. 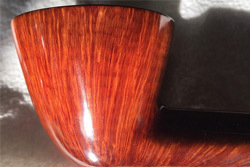 So many of these older pipes have such beautiful straight grain. I never knew why — until my meeting with Ken Barnes. I discovered that he is a master at finding the best grain out of each block of briar, a skill that came natural to him and that he developed to the nth degree over a period of two decades. Upshall Pipes were a spinoff of Charatans, in a manner of speaking. After Dunhill bought Charatan in 1978 from Herman Lane, three of the top men at Charatan decided not to go along with the sale and to start their own pipe company, which they named James Upshall Pipes. The three were Col. Barnes, his son Ken and the pipe maker Barry Jones. Incidentally, I have heard Ken referred to as Ken Barnes Jr. even though his first name is Kennedy and not Kenneth. But Ken says that even his mother would refer to him as Ken Junior since both he and his father were called Ken. 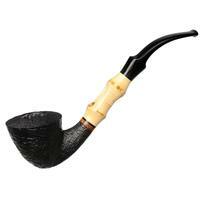 I should point out that other Charatan pipe makers also made their own brands after the sale to Dunhill. Dennis Marshall, who was in charge of production at Charatan and had previously worked at Barling Pipes in the 1950s and early ’60s, set up a pipe company called Millville with his son John. 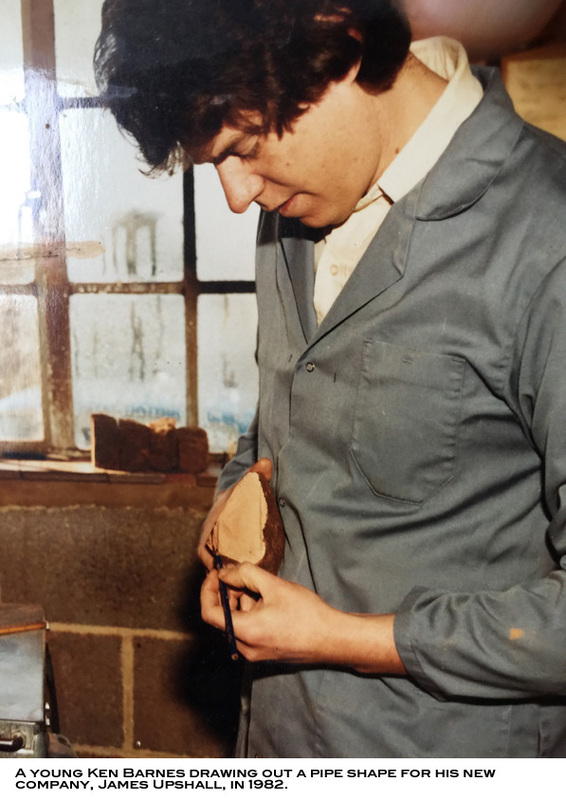 In addition, Stan Haney, who had worked alongside Barry Jones at Charatan and was a true "freehand turner," helped start a company called Ashby Hall. But the James Upshall company began with extraordinary success. They were instantly known for making beautiful pipes with fantastic grain, and the founders knew everyone in the pipe world and had no problem selling and distributing their pipes. Kenneth Barnes died within five years of the company’s founding, but Barry Jones and Ken continued to make and sell outstanding pipes. By the end of the company’s first decade, in 1988, Ken’s inner demands for success were taking a toll. His life had reached a point of chaos, where he says he became a workaholic, meeting a quota of 12,000 pipes a year — with the very high standards he placed on them — and his marriage was falling apart. His wife gave him an impossible ultimatum: the business or the marriage. In the end, he lost both and left the pipe world for more than a quarter century. 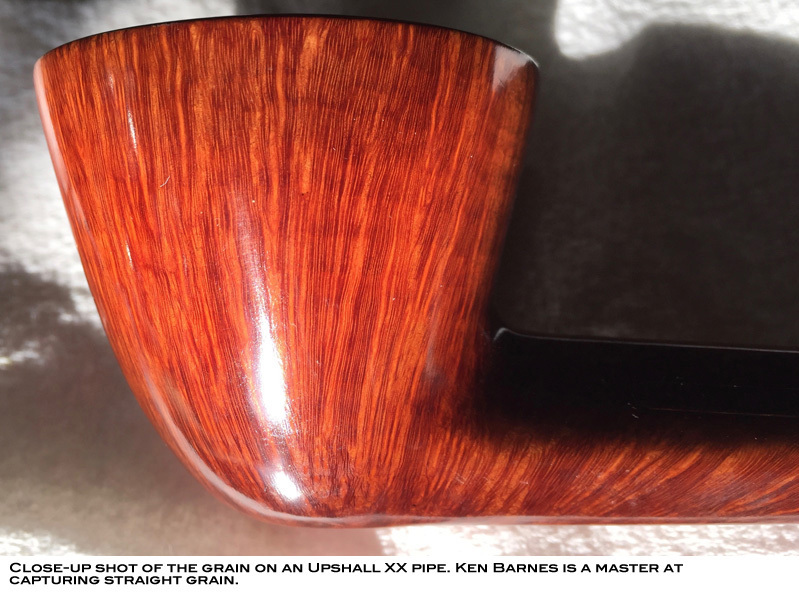 Barry Jones continued making Upshall pipes with a handful of employees, but Barry was an artisan more than an executive, and by the mid-1990s, he ran into financial difficulties. Enter an entrepreneur named Moty Ezrati, who bought the company and kept Barry on as head of pipe making. Everything went fine for the next 20 years — though the pipes Barry made without Ken’s strong influence and incredible skill at cutting briar — were nowhere near as beautiful as the pipes the two men had made together between 1978 and 1988. If you can find Upshall pipes made during those years, I highly recommend them. Same for their seconds, which were labeled Tilsheads. Ken met us at the Queens Hotel in Penzance on Friday morning, on May 20, 2016. It was a brisk 50 degrees and overcast. He and I went in his car to spend the day at his house in Cornwall while Carole spent the day sightseeing. We met back at the hotel at 6 o’clock before having dinner together. Of course I wanted to know why Ken had dropped out of the pipe world and what was he doing and, based on his radio interview with Brian Levine, was he interested in coming back? He explained that his life was in disarray after a decade of making Upshall pipes. He was such a perfectionist and pushing himself and others so hard that it put a strain on everything, especially his marriage. "I was a workaholic," he said. "I was not good at setting limits." After losing it all — his business and marriage — Ken decided to reinvent his life, so in middle age he returned to school to study for a degree in addiction counseling. He has pursued that career ever since, but now, at 61, he is cutting back on his workload and enjoying more free time. He is incredibly philosophical, and we had so many deep conversations in one day that it was amazing, exhilarating and exhausting all at once. When he looks back on his life, he quotes Socrates: "There are no mistakes — only lessons." I asked if he is enjoying his newfound freedom since he is reducing his workload as a counselor. "I have three types of days," he said. "There are great days; there are growing days, and there are glowing days." We had all three in one during our day together! "There is a study by Evans and Sullivan in which they put chaos on one end of the spectrum and rigidity at the other," he said. "Many people fall into the trap of living their lives in either one extreme or the other, when their goal could be to live between the two extremes. That is where I think true happiness lies." In addition to his profound philosophical and psychological insights, Ken knows how to cut a block of briar to maximize straight grain and bird’s eye as well as anyone I know. He just has a feel for the wood. For instance, one time he was in Les Wood’s workshop, where there were dozens of briar blocks on the floor. Remember, Wood had been a top pipe maker at Dunhill and then started making the highly respected LJ&S Ferndown pipes. Ken casually glanced at the blocks of wood on the floor and the grain of one just jumped out at him. He pretended not to notice and continued talking to Les, who then said, "Why don’t you grab a block and we’ll make a pipe?" So Ken picked out the block that he had seen — as if picking it at random — while never losing eye contact with Les as they continued talking. As the pipe was being made, Les said, "My God — were we lucky with this piece of wood!" Ken knew that luck had nothing to do with it, though he pretended to be happily surprised. As a briar cutter, there was little that Ken couldn’t do. He once visited a sawmill in Greece and was handed a giant sphere of dripping wet briar that weighed 20 pounds. He was supposed to hold it with one hand on each slippery side and slowly allow the 16" circular saw to click through it, while making sure that the saw did not slice him in half or cut off his fingers! "I was a little scared," he said. "But I wanted to show the workers that I could handle such a big circular saw. Fortunately, I succeeded." The owner told Ken that when Alfred Dunhill was asked if he wanted to try out the saw, he apparently went white and declined. 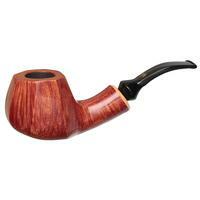 Ken’s primary supplier of briar was Otto Braun, and James Upshall Pipes used briar from Greece. Otto supplied many of the top pipe brands for years. "Otto was always after us to make hand-cut mouthpieces. He would say our pipes were too beautiful to use molded stems, but it was not cost-efficient when you’re making 12,000 pipes a year. Otto said, ‘It’s like wearing a beautiful suit with dirty shoes — and then you have to put these shoes in your mouth!’"
Most of my Upshalls have their original mouthpieces, and I think Otto was exaggerating greatly. However, I do own one Upshall X and three double X’s (their highest grade), as well as two almost perfectly straight grained Charatan Supremes, that I had altered more than 20 years ago. I bought these pipes from Basil Sullivan, Fred Janusek, and Barry and Nikos Levin. They were and still are among my favorites. But I always felt like the pipes were better than the stems. In 1995 I met Jess Chonowitsch and introduced him to the American pipe collectors and said that I thought he was one of the greatest Masters of all time. I had never seen such beautiful pipes that smoked so well. Obviously since then Jess has become a legend as a maker of high-grade pipes, but in those days, while he was still making his name, he was open to doing repairs for me. So I gave Jess all six of these pipes and asked what he thought. He studied each one carefully and commented on how beautiful the grain was. He also thought they needed hand-cut mouthpieces, which he proceeded to make over a period of two years. In some cases, he slightly rounded the top of the bowls and made other artistic alterations. In one case, a Charatan Supreme, there was a fracture in the shank, so Jess added a boxwood ring at my request when doing the repair. These pipes combine Jess’s extraordinary artistry and skill, plus the vision of each pipe that I saw for myself — how I thought the pipes should have been made. I know many collectors of Charatan and Upshall pipes were appalled that I would dare tamper with the originals, and I understand their point of view, but I disagreed then and now. I brought all six to show to Ken, though I admit to being apprehensive. I could just hear him screaming, "How could a REAL COLLECTOR alter a Charatan Supreme or an Upshall X?!?" But no, his reaction was all that I had hoped for. When he pulled the first Upshall out of its leather sleeve, he gasped in wonder. "This is so beautiful!!! 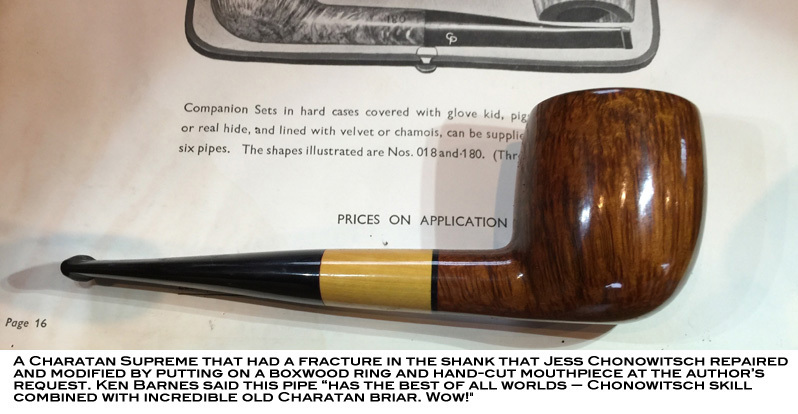 Jess Chonowitsch has captured exactly what I saw in this pipe! I remember this bowl — you don’t see grain like this very often." I then pulled out the other five and Ken was silent, almost holding his breath, turning the bowls this way and that, studying each pipe intently. I didn’t breath a word. It felt like a spiritual experience. 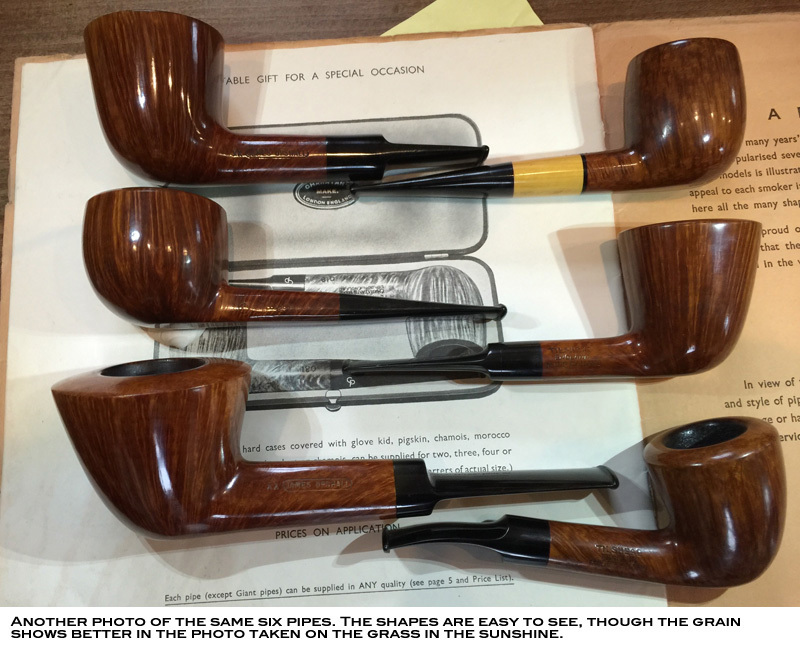 Finally, he said, "You know, I have sold more than 100,000 pipes over the years, including more than 50,000 Upshalls, and I would consider myself lucky to see one of these pipes — but six all at once, this is more than I ever imagined. I feel so emotional about what you have done, so fortunate that you are showing me these pipes." Ken wanted to take photos of all six pipes but the lighting did not show the grain, so I promised to take some after I returned home. His photo highlights the shapes very well, and I took a picture at home in the California sunshine that shows the grain. 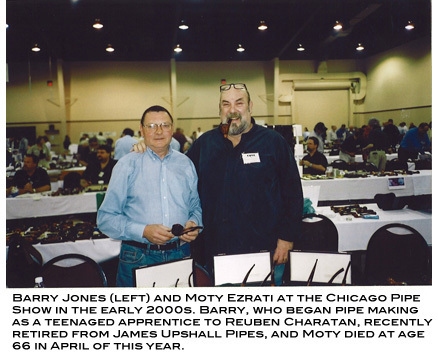 While we were talking, Ken told me that Barry Jones had recently retired as a pipe maker and Moty Ezrati had recently died. He also said Les Wood was retiring from LJ&S Ferndown Pipes without naming a successor. 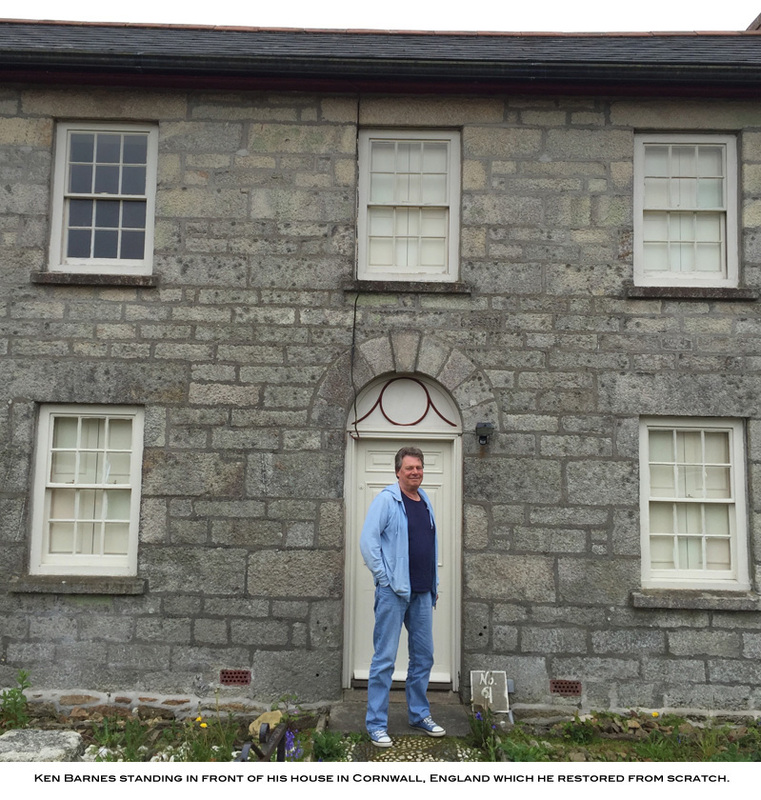 Ken’s beautiful house in Cornwall is near the southwest coast of England, and it was built in the 1850s. If you have ever seen the television series "Doc Martin," which I highly recommend, you know what the coast and coastal villages look like there because it is where the TV series was filmed. Ken painstakingly restored the house, brick by brick, including putting on a new roof by hand. He actually sleeps and works in the coach house in back. The coach house and main house are connected by the two modern kitchens that he installed — one kitchen for the main house and one for the coach house. Since cutting back on his counseling work, Ken finds himself increasingly interested in pipes. He bought a 1920s Charatan "golfer" shaped pipe — a small straight-grained pot with a slightly longer shank — at a swap meet. 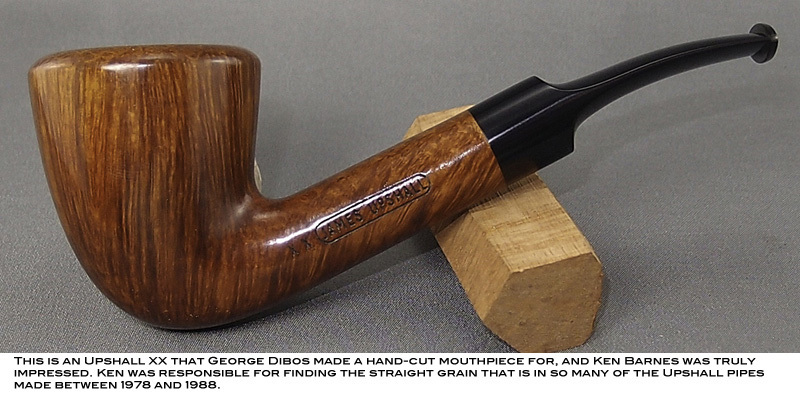 He checked the Internet and found that Tad Gage had written about what a rare pipe he now owned. He also found a 1912 Charatan with a silver band, which he was able to date by the hallmark on the silver, and the maker’s mark (F.C. for Frederick Charatan). If you are interested in the history of Charatan pipes, there are several interesting and comprehensive articles on the Internet. My favorite is Tad Gage’s article, "Charatan Pipes: The Mysterious and Marvelous Marriage of a Pipe-Making Family and a Renowned Tobaccoman." Also, Pipedia has an interesting history as well. You might notice occasional discrepancies in dates, and I’m not sure what to make of that. For instance, according to Ken, the birth registry directory archives say that Frederick Charatan was born in 1849, yet all Charatan packaging has "England’s oldest pipe-makers, est. 1863,” which would mean Mr. Charatan was 14 years old when he set up his first shop. Well, Ben Franklin was 15 when he and his brother started their first newspaper. Maybe it was different in those days, or maybe someone has a better explanation. 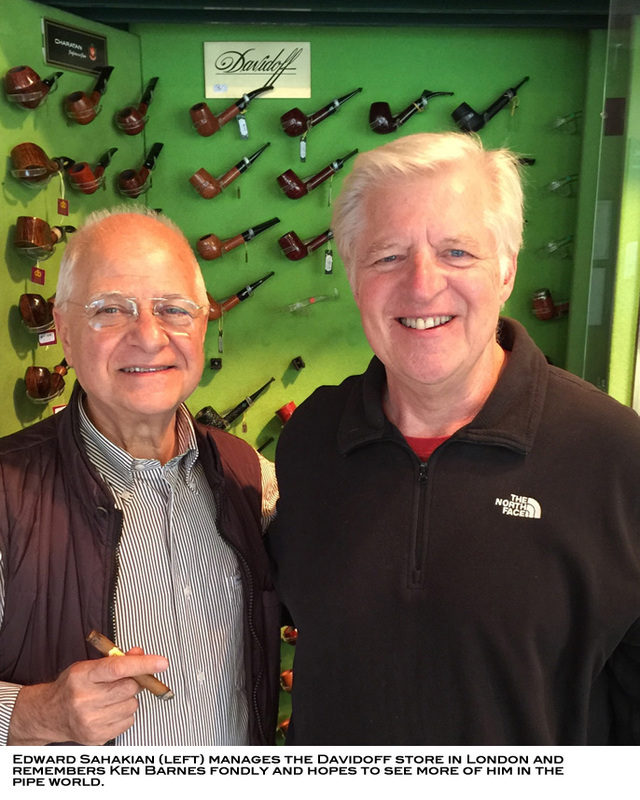 Getting back to today, Ken speaks highly of the respected Minneapolis pipe maker Rich Lewis, who spent time studying with Ken and Barry Jones at the Upshall factory in the 1980s. I told Ken that I bought an Upshall Dublin with a ring-grain sandblast from Rich at the RTDA one year and then sent it to Jim Cooke to have it re-blasted to make the rings pop as much as possible. He said that was after his time because Upshall only made smooth pipes during his tenure. He said that if a pipe was a second, they would label it Tilshead rather than Upshall but keep it smooth. 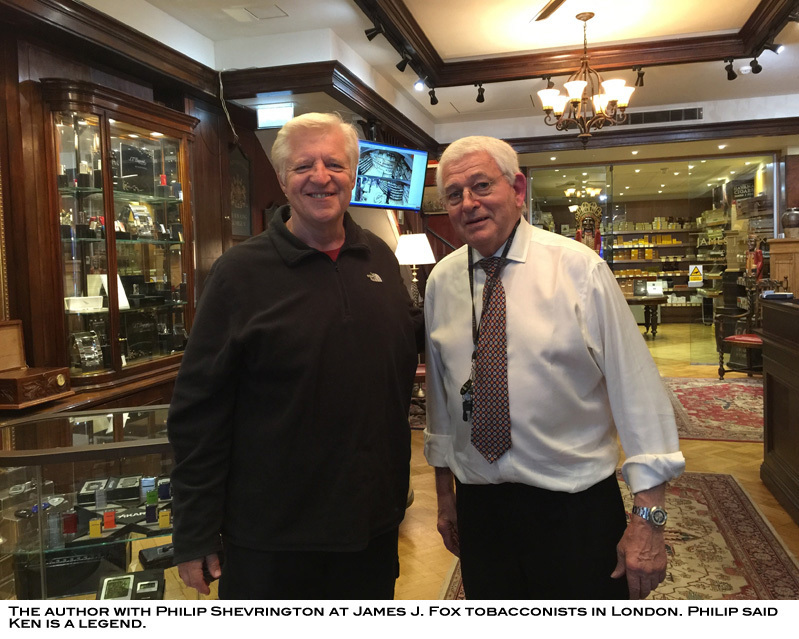 Ken grew up in the tobacco business — his mother’s father owned a large tobacco company in Germany and his father was managing director of Charatan and later opened his own tobacconist store in Salisbury, England. Ken worked in pipes in Germany and is fluent in German as well as French, and, of course, English. In addition to Pete Siegel, whom Ken praises effusively, he also cites Mario Lubinski in Italy and Detlef Seiffert in Germany as individuals who helped and inspired him in the early days. Some of these names are mentioned in Brian Levine’s radio interviews with Ken (Episode #178) and with Pete Siegel (Episode #189). When we were at his house, Ken mentioned that he has been searching eBay for rare pipes to add to his collection or to sell. 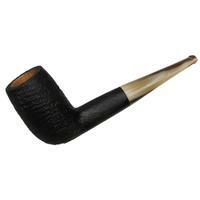 He said he sent some to another English pipe maker for reconditioning and restoration and has been waiting five months! I asked why he did not do that himself. "If I had the tools, I could do it in my sleep," he said. "But I don’t have the equipment." I suggested that he buy a handful of items and set up a small workshop for his eBay purchases and to make a few pipes just for fun — maybe two or three a month. "This is your chance to make a handful of high-grade pipes from scratch without any financial pressures or deadlines," I said. "It would be just to have something to do that you enjoy and are incredibly good at." 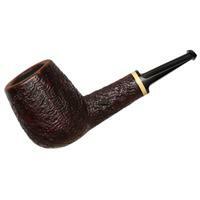 After our visit, when I was back in Los Angeles, Ken sent me an email saying that he has been looking at fine plateaux briar on the Internet and watching Youtube videos of various Danish pipe makers and eBay listings of high-grades. "There are one or two fine pieces that stirred something in me," he said, adding that he keeps thinking about the six pipes I showed him that had been tweaked by Jess Chonowitsch. "They are truly what I wanted to achieve all along (with the hand-cuts beautifully married up). The most beautiful pipes that I have ever seen in one sitting, and may I say, most carefully smoked and tended to." 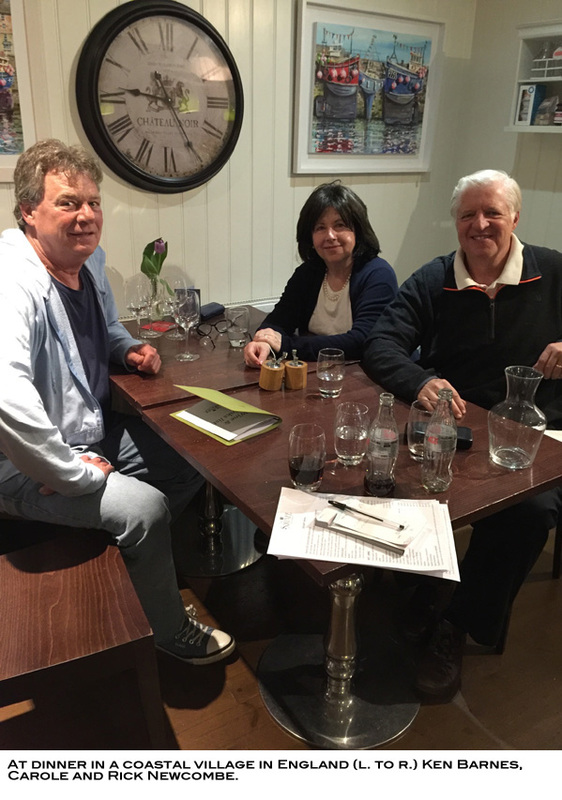 After leaving Cornwall, Carole and I visited London for two days, and I stopped by Davidoffs and James J. Fox tobacconists. In both cases I saw experienced looking men and asked if they knew Ken Barnes, and in both cases they were so happy to hear his name. Their names are Philip Shevrington at Fox’s and Edward Sahakian at Davidoffs. Almost word for word, they said, "Ken Barnes? He was the best — kind, smart, cheerful, positive and very talented. Whatever happened to him?" When I gave them an update, they were thrilled. We had pictures taken, which I sent to Ken, who told me that he is really tempted to get back into the world of pipes, at least in a non-demanding way. "I am still processing so many emotions since we met," he said, and later added this in his email: "Then more memories flooded back as you sent me photos of you and Philip and Edward! Such lovely people." I went to Fox’s to buy a tin of Bankers and Dorisco tobaccos and was appalled to see that the government had forced the tobacco blenders to include disgusting pictures on the tins — photos of cancerous lungs, that sort of thing. We used to treasure aged tins of pipe tobacco, but the new tins make me want to transfer the tobacco immediately to something else and throw away the tin with the public health warning. This seems so out of touch with the reality of pipe smoking and pipe collecting in the 21st century, where nearly all pipe smokers practice moderation and no inhaling, and there is virtually no lung cancer. Anecdotally, I have known thousands of pipe smokers and do not know of a single one who got lung cancer, except for those who were also heavy cigarette smokers. But looking at those labels, and thinking about the news about Moty Ezrati dying and Barry Jones retiring from Upshall, and Les Wood retiring from Ferndown, I could not help but wonder about the future of pipe smoking and pipe collecting. Yet during our trip I received an email from Craig Cobine saying that the 2017 Chicago Pipe Show is already SOLD OUT!!! Is the hobby of pipe collecting growing or declining or simply changing — from millions of drugstore amateurs to thousands of connoisseurs, as I wrote in my first book? I really don’t know. What I do know is that I love pipes, and I especially love beautiful pipes. I love it when a pipe maker knows how to capture straight grain and bird’s eye, and I consider myself very fortunate to have spent time with a pipe maker who has an incredible eye for cutting briar blocks to maximize their grain. This was an honor for me, and I hope that we in the pipe world continue to hear the name Ken Barnes in the future. As usual, another great article from Rick Newcomb. Rick’s complete, in depth writings are very informative and easy to read. I’ve been smoking and collecting Charatans since the early 70’s ( Purchassed at the now defunct Trinity East B&M in RVC NY) and I guess it’s about time I learned to pronounce the name correctly. Thank you Rick!! “A spiritual experience”, indeed! Just reading of your visit made me glow. James Upshall pipes were some of my earliest high grade pipes and getting a peak into their creation is fascinating. What a fabulous article. I always feel honored when folks like Ken, Pete and Rick take time to share some of their knowledge of the pipe industry with this forum. When I make a trip to England, Ken will be on the “must see” list. Thanks for summarizing the trip and your time with Ken. Aymen with ssjones above! I felt in the presence of the true and sincere demi-gods of the pipe-universe as I was reading and re-reading this article!! 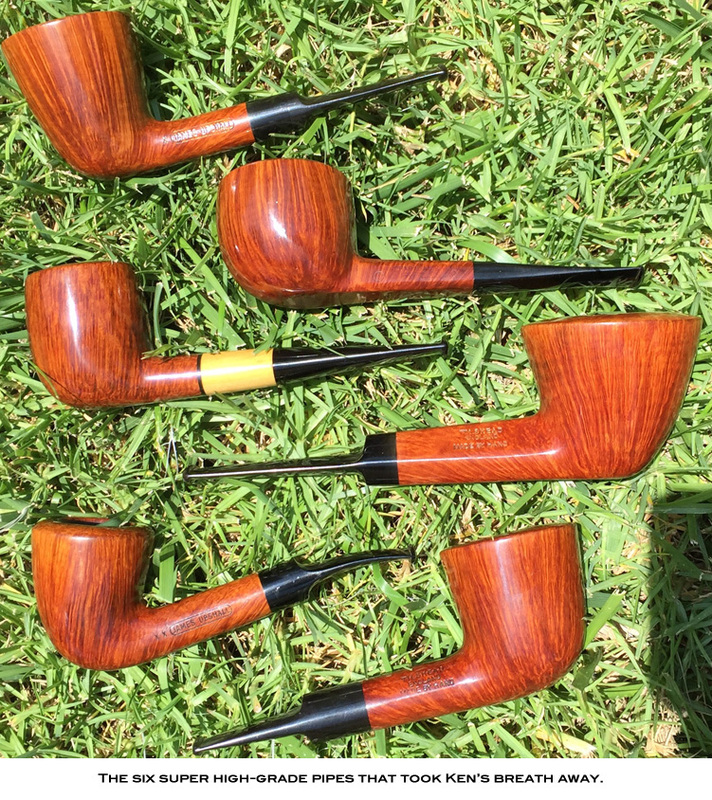 All the things I love about the pipe community… the collegiality, the thoughtfulness, the camaraderie, the conviviality, the shared heritage, the huge league of extraordinary gentlemen, all came together in this lovely and inspiring article! All this is part of why we enjoy and love our pipes and tobaccos! And also again many, many thanks to Rick and Ken et al for sharing their experiences together with us all! I felt honored and exalted that they gave us this wonderful window into their lives and times! Must go toast them with a bowl of the finest! And thank you, Kevin, for publishing this on the best pipe site in the world! Sadly, I’m reminded of a line from the George Jones song, “Who’s Going to fill their shoes”. Your pappy wrote and sang a good song! As to who will do the filling of the shoes, it remains to be seen, but I think there are some bright stars on the horizon. Good article, and JJFox and Davidoff are my must visit spots when in London; Cornwall is second, especially in Doc Martin land. Sure, there are plenty of fantastic pipe makers, but not so many in England (Askwith, Larryson, ?). Good point. I also meant to amend my observation that there isn’t the likelihood of a high quality factory coming online, either in GB or the US. Thank you ! I enjoyed reading this article. Thank you for sharing, I am left speechless. Wow, what an incredible article with beautiful photographs. Why did Rick have to tell us how to pronounce it correctly. We were happy in our ignorance. Now we will constantly be corrected b those who want to show they are more sophisticated than we. Great job on the article, Rick! Again, another fantastic article done by one of the great writers of our hobby. A great update on many of the names that are the foundation of the hobby. Can’t thank you enough Rick. Thanks to everyone for so many kind comments. Dan Locklair wrote to me and spelled the phonetic pronunciation CHAIR-atan, which I thought was more helpful than the way I’ve been writing it, i.e., CHaratan. Tad Gage remembers Herman Lane pronouncing it CHAR-atan. What I can’t figure out is why we in America have always pronounced it Sheraton. I wonder who started that. But it’s funny about the pronunciation of a family name: There is no debate if the family insists that it be pronounced a certain way. After 40 years of saying Sheraton, I don’t find it easy to say CHAIR-atan, but I’m working on it. Even though I have already commended Rick personally on his fine article on Ken, I wanted to reiterate it here. Ken is not only a skilled professional, but a kind and generous man. Rick’s article, along with the splendid photos, captures all that so beautifully. As for the pronunciation issue, my one and only visit to the Jermyn Street Charatan store in London in the 1970’s immediately set me straight on that! Then, a lovely day with Ken at the Upshall factory in Tilshead in the ‘80’s only reinforced the proper “CHAIR-atan” pronunciation. 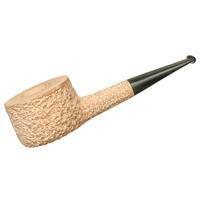 However, even pronouncing it correctly with fellow American pipe collectors, not once do I remember gaining converts! With hope, the time is now right for the “proper” (as the British love to say!) pronunciation to stick. A great article! I wish some day to have the opportunity to meet and talk to a master of this craft. This man Ken Barnes is a part of the old world and also the new. Thanks for a great article, Rick. I was recently in Penzance for our summer holiday; I’m sad to say that the latest piece of loony legislation in the UK has gone beyond horrible labels and now prohibits any sight of tobacco in shop windows, even if it is in the interior of the shop. The resulting cost of refurbishment and loss of business has forced a number of tobacconists to close, including the superb West Cost Cigars in Penzance, which was a mecca of both pipes and tobacco, as well as cigars. John Marshall - mentioned in your article - still makes Millville pipes and sells them from a stall in Jermyn Street Churchyard, very close to the old Charatan store. Based on the original Charatan blueprints (held by John’s father, Dennis), these are beautiful pipes with often incredible grain at very reasonable prices. John makes them for love, not money. John was a craftsman at Charatan and is a goldmine of knowledge and stories about the marque and it’s history. Sadly Dennis is unwell and others in John’s family are struggling with illness, so it’s real uncertainty as to how long John will continue to hand-make and sell pipes under what was once the hugely successful Millville brand. I strongly recommend that anyone visiting London goes along to see John for a browse/purchase and a chat. John Marshall’s stall in the Churchyard on Jermyn Street is a gem. IIRC, it’s towards the back, right side. But almost all the other stall keepers know John, and his comings and goings. Don’t hesitate to ask if you can’t find him straightaway. It will be my first stop on my next visit to London, then Fox and Davidoff. The USA is getting as bad as the UK, if not worse. The Food and Drug Administration wants to prohibit tobacconists from blending in their stores. There is even talk of forcing them to hide all their pipe tobacco in boxes and only show customers pictures of the tobacco. This is insane! Power corrupts and absolute power corrupts absolutely, as Lord Acton said. Pipe smoking is such a wonderful hobby, and the fascists are determined to wipe it out. They will never succeed, but so many of the rich traditions of our pastime’s history are being driven underground by state decree. What happened to freedom?